For many people nothing beats a 4th of July cookout with friends and family. While your pet is part of the family, the reality is this could be a potentially hazardous day for your pets to be part of the festivities. Your San Marcos dog walker wants to provide you with some tips to keep your pet(s) safe and stress free. 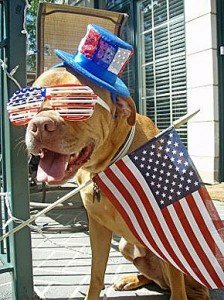 Desensitize your pet: Try playing a CD of fireworks or visit youtube for videos. On the show “It’s me or the Dog,” they used the CD method to desensitize a dog to thunderstorms. Start with it on low for a short duration. As your pet gets more comfortable you can increase the duration and/or volume. If your pet shows fear, lower the volume until your pet is more comfortable. Anxiety methods: There are several homeopathic methods you can use instead of powerful drugs. The natural methods should help relax them without knocking them out or impairing them. Tip: Cooled chamomile tea can help them relax. The bonus is if their nerves get the best of their tummy, it helps with that too! Crate: If you choose to use a crate or carrier, let your pet get familiar with this before you plan to use it. Closing a pet inside before they are ready could lead to your pet getting sick from stress, howling, crying and scratching/damaging their carrier and themselves. Current pictures of your pet: Should your pet escape, you can use this to make flyers. If you download the picture to your phone, this is another way to show people when you are out looking for your precious pets. WE got you covered! Happy Trails & Wag’n Tails pet sitting & dog walking clients can visit our Facebook Fan Page to get a picture. Simply tag yourself in the photo and presto you have a current photo of your pets. Drain their energy: A long walk or good game of fetch will help drain their energy. A exercised pet is a happy pet! Don’t baby them: Treat them the same as you would every other day. Some experts think “coddling” them while they are in a fearful state tells your pet it is okay to feel that way. Pet Retreat: Keep them in a separate room in a quite area of the house. Provide your pets with food, water, toys and play some relaxing music to keep them stress free. Drown out the sound: Use a fan, TV or radio to block out the fireworks. “Hairy” Houdini: If you want your pet to be included, be extremely cautious when opening the door for guests or leaving them in the back yard. If the flight response kicks, you will find your pet can prove to escape from anything like he/she is Harry Houdini. Pet Id: Ensure your pets information is current and tags are attached securely to your pet. If your pet bolts out the door or jumps the fence, an up to date dog tag or micro chip will be essential. Many times pets will be picked up by a fellow animal lover or end up at the local Animal Control/Humane Society. Having current identification will help speed up the process of reuniting you with your pet(s). 1. Support this blog to continue seeing post like this. 2. Share this blog with friends. 3. Leave a Comment and get comment notifications for This post! Disclaimer: The information contained in this web site is provided for general informational purposes only. It is not intended to diagnose or treat your pet. If your pet has a medical problem, please seek medical attention from your veterinarian. Happy Trails & Wag’n Tails will do our best to ensure that information presented is accurate and up-to-date. Happy Trails & Wag’n Tails does not accept any responsibility for damages, loss or illness which may arise in connection with the use of the information published on this website. The decision to use, or not to use, any information is the sole responsibility of the reader. Opinions expressed here are those of individual contributors. © Happy Trails & Wag’n Tails, 2006-2019. All Rights Reserved. Fight fleas naturally: Protect your pet, home & yard! 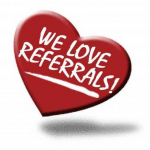 Referrals are one of the best compliments I can receive. If you refer client(s) who book and complete pet care services with us, you will be rewarded! Keeping your pets Safe, Healthy and Happy in your Carlsbad CA, San Marcos CA and Escondido CA home!